Hitomi's been bugging me to go skiing recently. There are a couple of excuses that have kept me away from the mountains. Mostly it has been not having a good car (snow tires or chains) for getting through the snow. In the snow, I've also been quite cold and wet, if only due to a lack of proper clothing. And I never did care much for paying a lot of money for (often crappy) rental equipment or lift tickets. And I've been on many ski trips where the conditions were either icy or slushy or wet, or when there was not enough snow. And I've had a share of painful experiences falling or being out of control. Last year I attempted to wear some alpine skis borrowed from Kevin. I was in deep snow on a steep slope in deep forest without having skied recently, and (of course) I uncontrollably descended. This was the only time I had gone skiing with Hitomi, so she was convinced I didn't know even how to stop. Through the magic of the Internet and a few phone calls, she signed us up for a day out at Crystal Mountain, opposite Mt. Rainier, and a few hours' worth of lessons. There was a bus from the Park & Ride at 6:45AM and all we had to do was walk down. The lessons were provided by Jed, an old timer who used to be stationed in Japan and knew a fair bit of Japanese. He was nice to us both and though Hitomi was more advanced, Hitomi had yet to use newer skis with newer techniques. Jed led us through some exercises and so once I paid attention to my body position, practiced a bit, and relaxed I felt I could ski again. Having the lessons certainly helped the process go quicker, though the lesson was expensive. Rentals weren't cheap either: About $35 each. I figure if we went about 10 times would be the same price as buying new equipment. Although it was sunny and pleasant weather, the snow conditions weren't great, due to all the sun of the prior week and lack of new snow. There were just a few runs we did and the best were around the trees (shaded) where the snow was more fluffy. Returning home it started to snow and I knew we should have left Sunday. 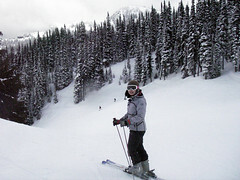 This entry was posted in Uncategorized and tagged crystal mountain, hitomi, rainier, skiing. Bookmark the permalink.